(CNN) -- Spanish police Thursday arrested a suspected member of the Basque separatist group who is wanted for six killings in the 1980s, the Interior Ministry said in a statement. Juan Manuel Inciarte Gallardo is wanted for six killings in the 1980s. Juan Manuel Inciarte Gallardo, 55, was detained at Madrid's airport after he was expelled from Mexico for lack of proper documents, the ministry said. The arrest came a week after authorities blamed ETA for two major car bombings -- one that killed two Civil Guard officers on the Spanish island of Mallorca, and one a day earlier that injured more than 40 people at a Civil Guard barracks in the northern mainland city of Burgos. ETA is blamed for more than 800 deaths in its long fight for Basque independence, and is designated a terrorist organization by Spain, the European Union and the United States. 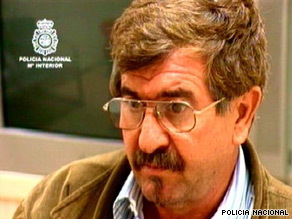 Inciarte is wanted in Spain for the 1980s killings of five police officers. In one of the attacks, the pregnant wife of an officer was killed, along with her husband, the ministry said. An anonymous tip alerted authorities in Mexico to Inciarte's presence, the ministry said. He is believed to have been hiding there since 1996. The attacks last week brought renewed fears thatETA might again be regrouping, despite numerous arrests in Spain and also in France, ETA's traditional rearguard base. Spanish authorities repeatedly said ETA was weaker than ever, but still maintained the capacity to attack. In the Mallorca attack on July 31, authorities said the two officers died from the explosion of a "limpet bomb" placed under their Civil Guard vehicle. Officials initially said the bomb was detonated in a parked car while the officers drove by, but investigators later determined the bomb was attached under the Civil Guard car. The bombing of the Civil Guard barracks on July 30 in Burgos, 237 kilometers (146 miles) north of Madrid, occurred before dawn, and notably did not include a prior warning call, which ETA often makes before such attacks. The blast heavily damaged the Burgos barracks, injuring Civil Guards and their families, including young children. All injuries were described as slight, such as from flying glass. The attacks last week coincided with the 50th anniversary, on July 31, of the formation of ETA. The group seeks independence for about two million people who live in three Basque provinces in northern Spain, and for another 700,000 who live in an adjacent province with Basque roots and in three departments in southwest France.